The Temple of Gravity, a rock and steel sculpture designed to explore its relationship to the force of gravity and installed in Nevada’s Black Rock Desert as part of the Burning Man arts festival, is scheduled to move to a new temporary home in Desert Hot Springs, California, in December 2003. The Temple of Gravity is an 80-ton public art project designed and fabricated in southwest Atlanta, comprising five 17,000-pound granite slabs angled to hang between 6 and 12 feet above ground level. The supporting structure is a steel dome which also bears the weight of a suspended fire cauldron. The design is open to the sky, without a roof or walls. Its wood-burning fire provides both light and heat as a metaphor for the structure of the earth. This sculpture is the brain-child of the Atlanta-based sculptor Zachary Coffin and created in collaboration with Keith Helfrich, Corbett Griffith, and Paul Jorgenson, who formed Gravity Group, LLC to fund the work, began with US$20,000 commission from the Burning Man arts festival. 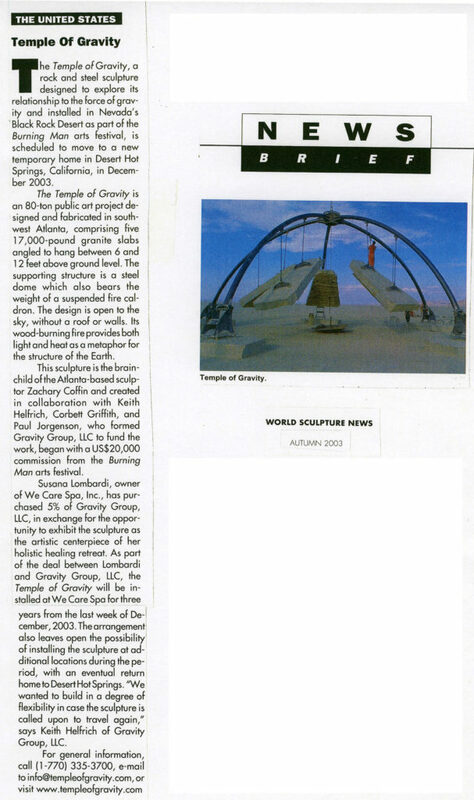 Susana Lombardi, owner of We Care Spa, Inc. has purchased 5% of Gravity Group, LLC, in exchange for the opportunity to exhibit the sculpture as the artistic centerpiece of her holistic healing retreat. As part of the deal between Lombardi and Gravity Group, LLC, the Temple of Gravity will be installed at We Care Spa for three years from the last week of December, 2003. The arrangement also leaves open the possibility of installing the sculpture at additional locations during the period, with an eventual return home to Desert Hot Springs. “We wanted to build in a degree of flexibility in case the sculpture is called upon to travel again.” Says Keith Helfrich of Gravity Group, LLC.